At its third annual gala, the magazine honored four professionals for their work helping people with glioblastoma. The decision to focus one’s life around the welfare of others is both rare and admirable. Even more uncommon is the dedication to direct that care toward a tiny community most know little about. 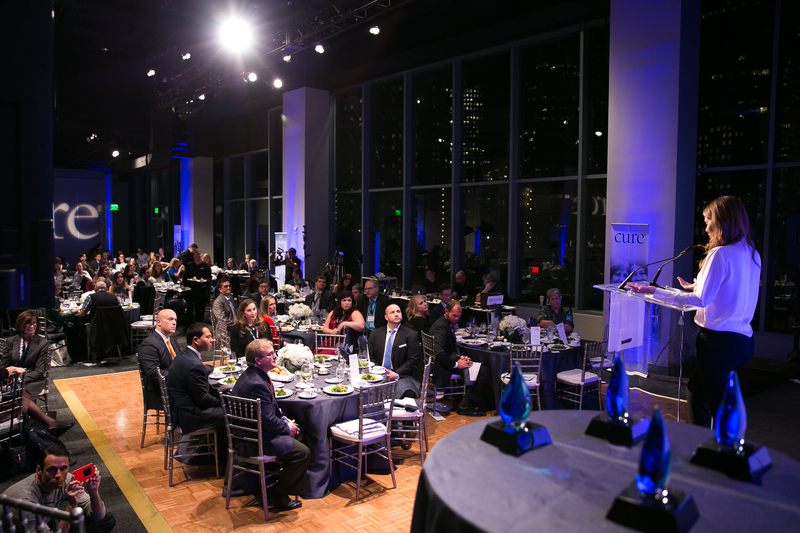 Last night, at a gala attended by neurosurgeons, patients and their advocates and loved ones, CURE® thanked four professionals for doing just that by working quietly and steadfastly to help those facing the brain cancer glioblastoma (GBM). 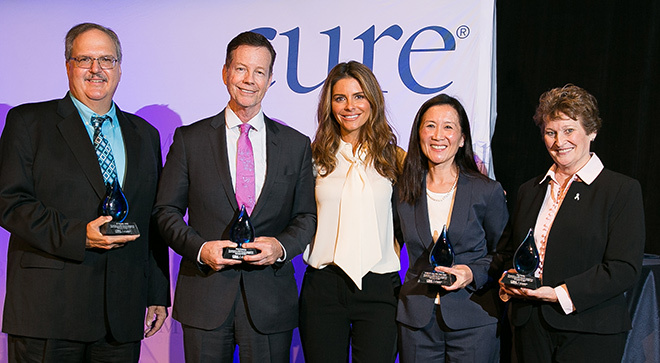 With help from keynote speaker Maria Menounos, an Emmy-winning journalist, actress and WWE wrestler whose own family is affected by the disease, CURE® honored the experts at its third annual GBM Heroes event in San Francisco, which coincided with the annual conference of the Society of NeuroOncology (SNO). Honored were Matt Anthony, who runs the Head for the Cure Foundation; Linda Liau, M.D., Ph.D., M.B.A., a neurosurgeon from the David Geffen School of Medicine at UCLA who developed an experimental vaccine to treat GBM; Al Musella, D.P.M., founder of the Musella Foundation for Brain Tumor Research & Information, Inc.; and Kay Verble, executive director of the Sontag Foundation, which funds brain cancer research. 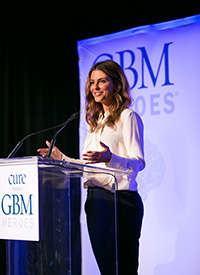 In an emotional talk about her own journey, Menounos, a former host of “Entertainment Tonight,” discussed her diagnosis with a benign brain tumor and her continuing efforts to support her mother, who has stage 4 GBM. Menounos, also the New York Times bestselling author of “The EveryGirl’s Guide to” series and CEO of the digital broadcast network AfterBuzz TV, said she learned early on that “life happened for us, not to us,” and to focus on turning negatives into positives. She relearned that lesson after she was diagnosed with meningioma, which she calls a “gift” because it reminded her that life should be meaningful, purposeful and fun. After years of striving to be the perfect daughter, partner and employee, Menounos declared that intention “absurd,” realizing it was not only impossible, but stress-inducing. “We’ve gone from being ‘human beings’ to ‘human doings,’” she said. Being attentive to our health and that of our loved ones should also be a priority, Menounos said. She recalled being on the set of TV and radio shows, experiencing blurred vision and slurred speech, and joking that she had a brain tumor — but not visiting a doctor to get checked out. Menounos suggested simplifying life to focus on “authenticity and enthusiasm,” and living in the present. The four GBM Heroes commanded the spotlight, too, as their nominators discussed their accomplishments. Jenna Heilman, executive director of Head for the Cure, praised Anthony for finding the motivation to help others through the loss of his brother, Chris, to GBM. “Matt has transitioned his mourning … into the energy to create this national organization that continues to inspire thousands of people who have been affected by brain cancer by providing a way to join the fight to defeat brain cancer step by step,” Heilman said. Anthony, a global advertising expert, along with his family, established the Head for the Cure Foundation in 2006 to raise awareness and funding for brain cancer research. Proceeds from Head for the Cure’s 5K run/walks, now in 25 markets, are directed to the Brain Tumor Trials Collaborative (BTTC), a consortium of brain cancer centers across the U.S. Since it was founded, Head for the Cure has raised more than $9 million to fund brain cancer research and advocacy programs. Liau, professor and chair of the Department of Neurosurgery at the David Geffen School of Medicine at UCLA and director of the UCLA Brain Tumor Center, heads a research laboratory and a clinical practice. An expert in intraoperative brain mapping for the removal of tumors, Liau developed one of the first human applications of a personalized brain tumor vaccine (DCVax-L), now being tested in clinical trials. Ashley L. Sumrall, M.D., FACP, of the Levine Cancer Institute, in North Carolina, said that Musella’s foundation has made a difference. Musella has been dedicated to supporting patients with brain tumors since his sister-in-law was diagnosed with GBM in 1992. Later, his father was diagnosed with the disease. Musella created two online firsts for people with brain cancer: a support group and a clinical trials database. He also founded the Brain Tumor Virtual Trial, which collects and analyzes data about treatment outcomes to help patients weigh their options, as well as a website, VirtualTrials.com. He formed his foundation in 1997, and is now working to help patients obtain early access to experimental treatments. A social worker who wanted to make a positive difference in lives, Verble discovered an outlet for that passion in 2002, when she met Susan and Rick Sontag, founders of the Sontag Foundation (sontagfoundation.org), which funds brain tumor research; she became its executive director. Verble has helped select and mentor 43 early-career researchers and clinicians who received Sontag grants for brain cancer research. She helped found a brain tumor support group in Northeast Florida, and has worked closely with other nonprofit leaders through the Brain Tumor Funders’ Collaborative. As executive director of the Brain Tumor Network (braintumornetwork.org) since 2014, Kay helped create a robust program of high-touch patient navigation services provided by a multidisciplinary team of nurses and social workers. The GBM Heroes event was sponsored by Novocure, developer of the medical device Optune. Worn on the head, Optune delivers low-intensity electrical fields that can attack dividing cancer cells, damaging their DNA, while sparing normal cells. “This is a special event for us, where we get to celebrate the important work you are doing to advance the mission we’re all a part of,” said Pritesh Shah, Novocure’s vice president, Americas. Erik Lohrmann, vice president of CURE Media Group, thanked SNO for its partnership in hosting the event and sharing the insights of those at the heart of the GBM community.